Today I’m about to do something I have never done on this blog. I’m going to post 7 sentences from page 77 of my WIP. Scary business for this author. Why am I doing this? Simple, writer Holli Moncrieff (A Life Less Ordinary) tagged me to take part in a lucky 7 meme. Thus the 7 sentences from page 77. See, had you known it was this easy for me to spill the beans I’m betting a few of you would have tried this before. I’m a good sport. What can I say? The truck sputtered a few more times before Hux cut the switch. If a truck could fart it would be old Hux’s. Butch was sitting on the passenger’s side, head stuck out the window. I reached in and patted him. His fur was slick and smooth, soft as a baby’s bum. His tongue slid out of corner of his mouth, pink and shiny as a junk of pig’s liver. I knew Butch found it hot sitting there in the truck but he had no say in the matter. That’s something Butch and me had in common. I didn’t have a say in anything either. Butch was a black and white bulldog, homely as a stump fence. I didn’t hold that against him, though. So there you go, 7 lines from page 77. Aren’t you glad you dropped in? Now if you want to make this interesting why not try guessing the next 7 sentences of “To Fly With A Broken Wing.” Just kidding… Hoping you all had a beautiful first day of spring. Here in Nova Scotia it was gorgeous. Happy Spring! Why writing is kind of like riding a bike. 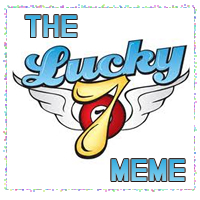 Thanks for tagging me with the lucky 7 meme. Loved your 7 sentences and am now eager to read more of To Fly With a Broken Wing. I felt like I was stuck in that hot, smelly truck. This will be another good story! Dial-up’ You got here before I had chance to tell you… LOL!! Enjoy! I like reading little snipets, even when it comes from a wip sneakpeak. :). Hi Marsha! I’m pretty stingy when it comes to sharing my work, but 7 sentences didn’t feel too bad. Today, was simply gorgerous.It felt like a day in late May. I love it! I had the same reaction when I found out I was tagged, and hoped it wasn’t something terribly boring. lol! chip. I want to dig into the whole bag. WAITING! DROOLING! WANT IT ALL. That was a good one. How have you been, Laura? Hi Punam! So nice to have you drop in for a visit. I’ve been great just a bit busy. Hope all is well with you! Wonderful, wonderful, excerpt, Laura. I could feel that smooth fur, feel that pink tongue. I love the voice, the narrative. Can’t wait to read this one. Congratulations, everyone. “Butch was smelling something on the air. Perhaps it was those gathering storm clouds on the horizon that caught his attention. Whatever, I knew that I needed to keep this visit short. Otherwise, Hux would have to wait out the storm here. And, if you knew him well as I did, he had a way becoming grumpy real fast. Please forgive the typos. The multi-tasker in me isn’t doing so well with multi-tasking today. Currently on a very dull conference call.